Largely due to the United Nations Millennium Development Goals, between 1990 and 2015 the amount of people living in extreme poverty has been reduced by half. Yet with over 1.5 billion people still living in extreme poverty, a 2030 goal has been set to free the world from extreme poverty and hunger. UN Secretary-General Ban Ki-moon said that while extreme poverty continues to be one of the main challenges of our time, and is a major concern of the international community, ending this scourge will require the combined efforts of governments, society, organizations, and the private sector. Close to one million people live in the slums of Nairobi and in the Dandora dump. There lives hang in constant peril from polluted water, illness, and dangerous employment. In Manila, Felipa Fabon sorts through a fried chicken restaurants garbage in order to find thrown away, half eaten pieces of chicken and bones. These are washed off, bagged, and the pagpag are sold for 20 pesos, which is often their full days pay. Though the chicken smells bad, its what they can afford. There is both a vulnerability and strength found within the poverty-stricken slums throughout the world. In the midst of heavy burdens that these communities face, such as lack of money and food, poor sanitation, polluted water, and exposure to hazardous waste, many of the people are strong-willed and resourceful. Some open shops in these poor areas, selling products, providing computer access, and services. Making do with what they can find, they are a celebration of humanity in the middle of tragedy. 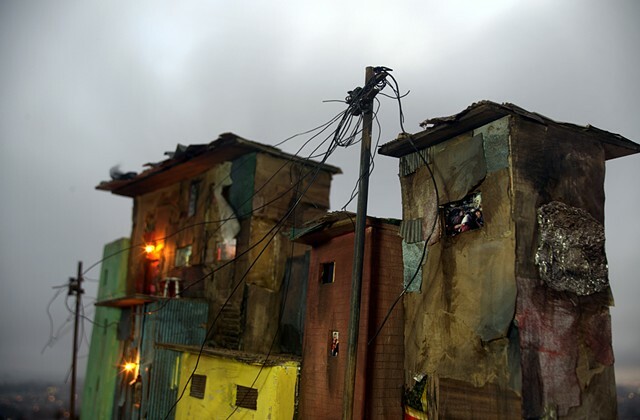 My installation, One Thousand Shacks, demonstrates the perilous situation that the worlds poor face, the social problems, as well as the strength that is demonstrated as they struggle to survive. One Thousand Shacks is a mixed media sculptural installation, consisting of an approximately 5 meter tall x 3 meter wide wall of small-scale shacks, one next to the other, piled high in an organized mess. They are attached to each other and appear as an insurmountable entity, giving weight to the 1.5 billion poverty-stricken people. Small lights and video show through the windows and doors. The wall is bustling and alive. On the back of the wall of shacks, wires, lights, media players, screens, transformers, and raw wood can be seen. This jumble of wires, wood and various electronics echoes the haphazard, often handbuilt-out-of-scrap essence found in many underserved areas. I hope to bring a larger awareness to the problem of poverty through this installation, and on a deeper level, to express the full experience of humanity--the good, bad, and in-between. The shacks will show the vast array of realities that exist in these places. Some will be immaculate, with clean dirt floors and curtains of found material. Others will show the cramped living quarters or squalor. In videos and images displayed in the windows and doors, there will be people struggling to survive, individuals working hard to make a living or scavenge for recyclables or food, as well as the darker side of things--drugs and domestic abuse. Additionally, I will explore how religion relates to those that are poverty stricken. Religiosity is highest in the poorest nations of the world. How does someone is such dire need view their circumstances when related to God? My installation will capture the delicate tension between the vulnerability and resilience found in these places, both the yin and the yang. One Thousand Shacks has received generous support from Donald and Judy Opatrny, The West Collection, Jeffrey and Jason Friedman, Robert Fama, Idan Levin, and a grant from the Center for Cultural Innovation.